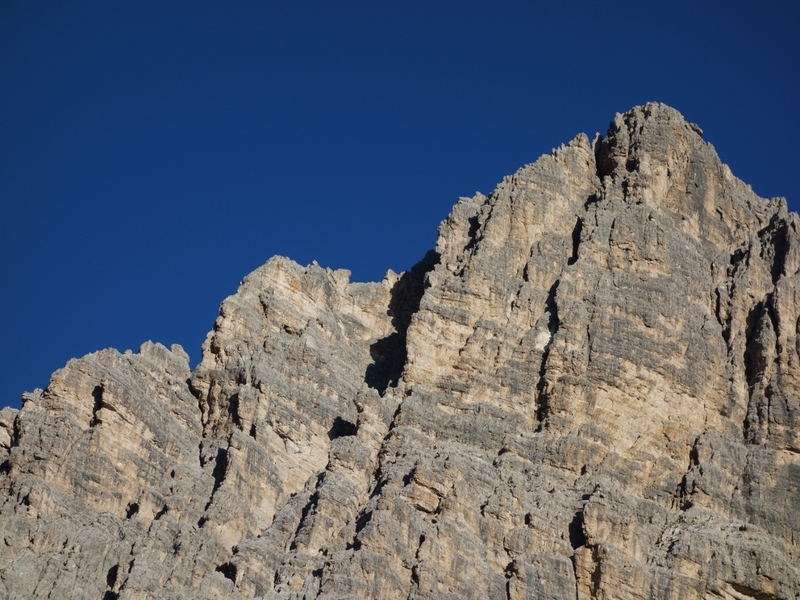 Today I sat in the sun on the verandah of the Pomedes hut watching through binoculars a tiny figure ascend the ridge of Punta Anna to the top of the Tofana di Mezzo. This was Jim, who had got up extremely early (me too) and walked out before the sun rose to do this demanding and classic Via Ferrata. 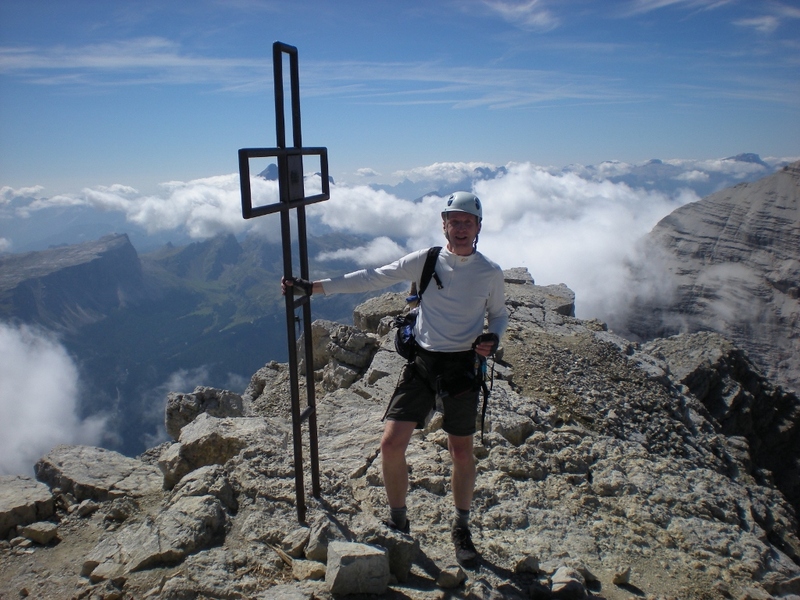 I had studied the guidebooks and agonised for days whether I would be up to it. There are some very strenuous and exposed sections including some that are without wire. In the end I decided on a spectator day. So I walked up to the start and sat on a boulder as the sun rose red on the rock, watching with glee as other climbers sweated their way up the hill knowing that Jim was the first on the route and imagining the thrill of that for him. I took photos as he ascended in the sun and finally retreated for breakfast on the hut balcony with binoculars. 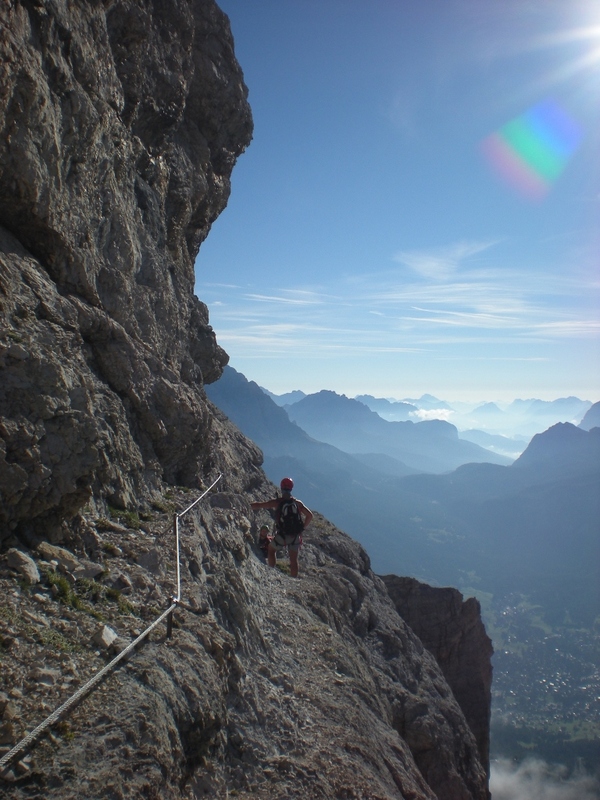 This superb collection of several via ferrata follows a ridge system north from Rifugio Pomedes, over the top of Punta Anna and to the summit of Tofana di Mezzo (3244m), the third highest peak in the Dolomites. 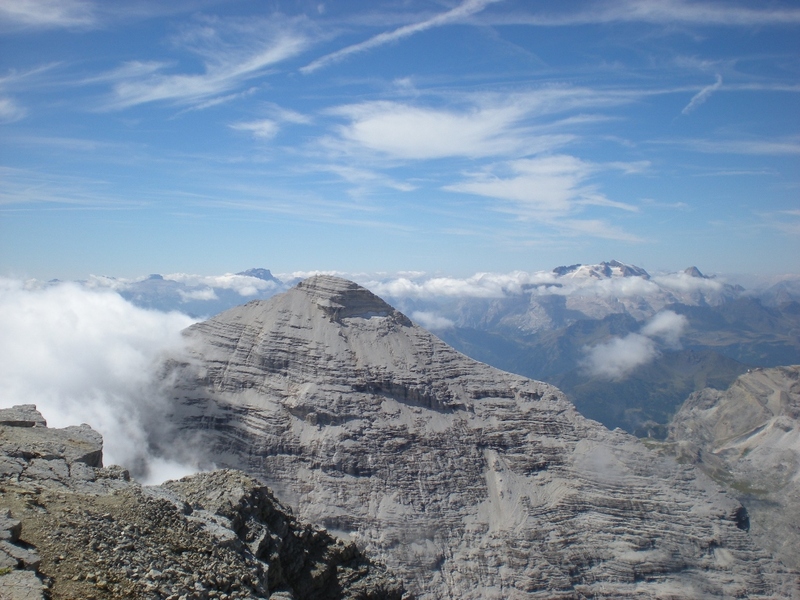 Approach from Rifugio Pomedes to the VF – From Rifugio Pomedes, follow a well-marked track uphill signed to ‘Punta Anna’. Ten minutes of switchbacks brings you to the start of the wire. The route begins steeply before a traverse out left gives you the first impression of the good exposure to come. 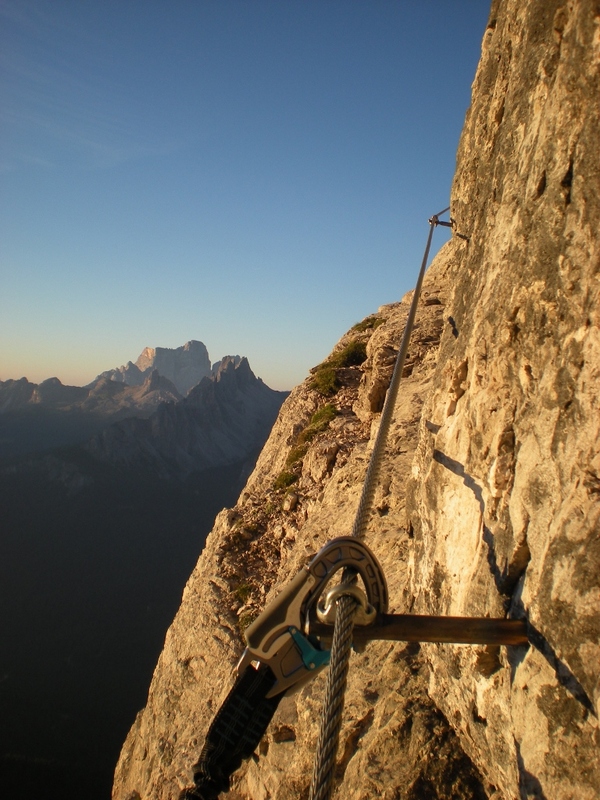 Good varied climbing on the wire is interspersed with easier unprotected scrambling up to the summit of Punta Anna. From the summit, the route heads north following the ridge-line, with cairns and arrows to mark the way. Continue past the signed path leading off left down to ‘Rifugio Giussani’ (possible escape route) continue along the ridge until a second junction is reached. 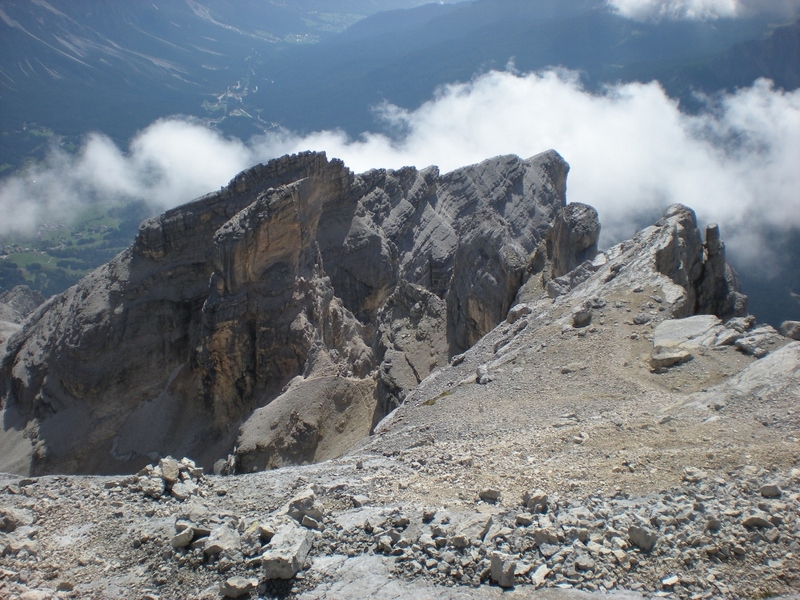 ‘Sentiero Giuseppe Olivieri’ is signed off to the right and this provides the second possible escape route down to Rifugio Ra Valles and the cable car mid station. To continue, turn left and follow the subsequent ridge-line eventually passing a ladder that provides aid through a difficult section. 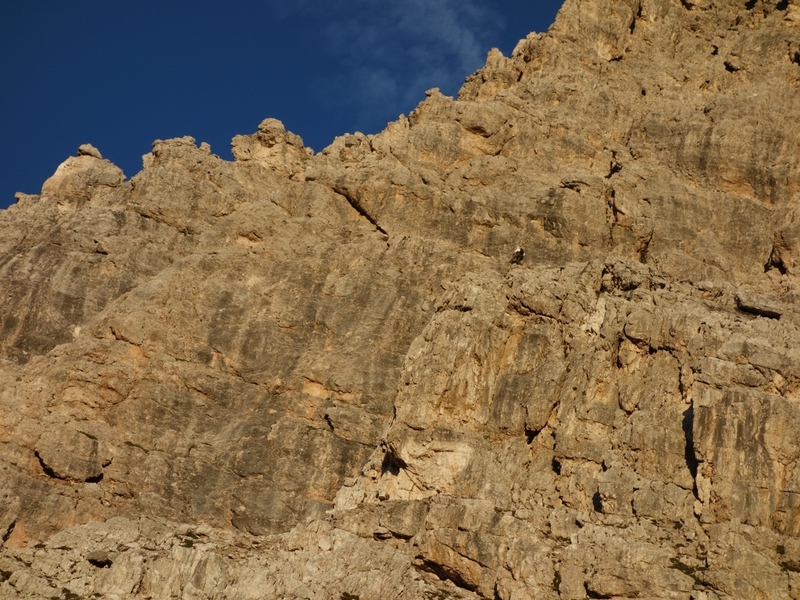 This leads to an exposed ledge and traverse on the west side of Torrione Gianni. From here there is an optional out and back ascent of Torri Gianni itself which is worth doing if you have the time (and energy). Be aware of potential traffic jams here on a busy day. 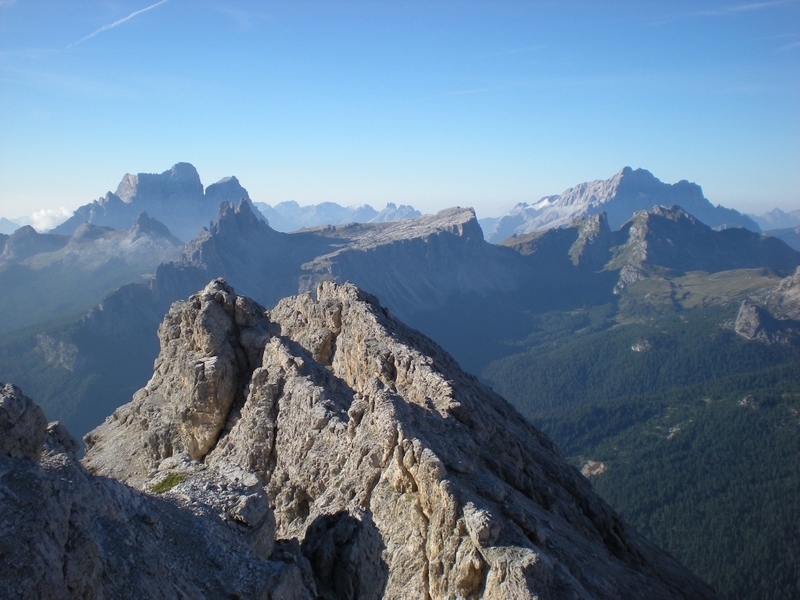 To continue the route, follow the traverse around the corner, with some fantastic exposure, until a further ledge allows you to down climb the col of the Bus de Tofana. 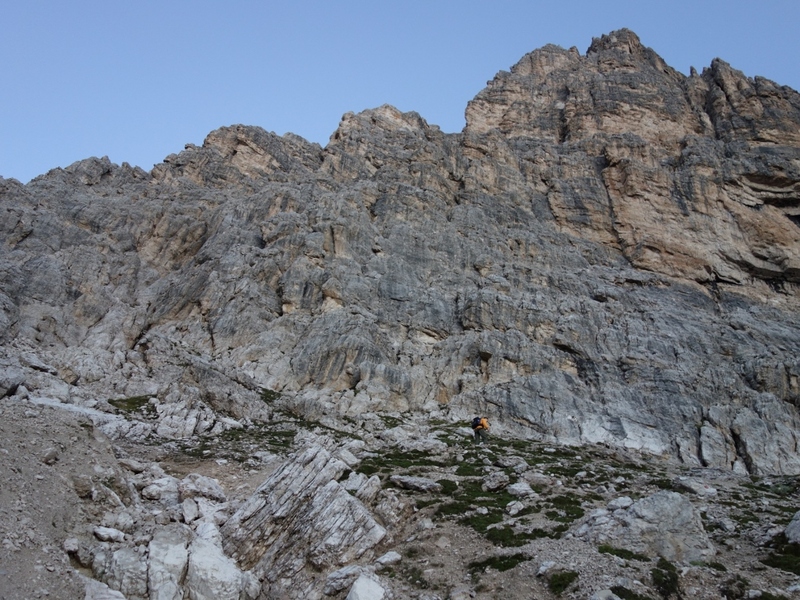 There is another possible escape route here by passing through the giant rock window in a westerly direction, following a steep scree slope to Rifugio Giussani. It is worth descending slightly from the Bus de Tofana to view the rock window, a descent through which is a popular ski touring itinerary in the winter. To continue, cross over to the opposite side (northwest) of the Bus de Tofana and follow the path through a not-so-scenic series of avalanche barriers (there are plans to divert the path around these in the future). 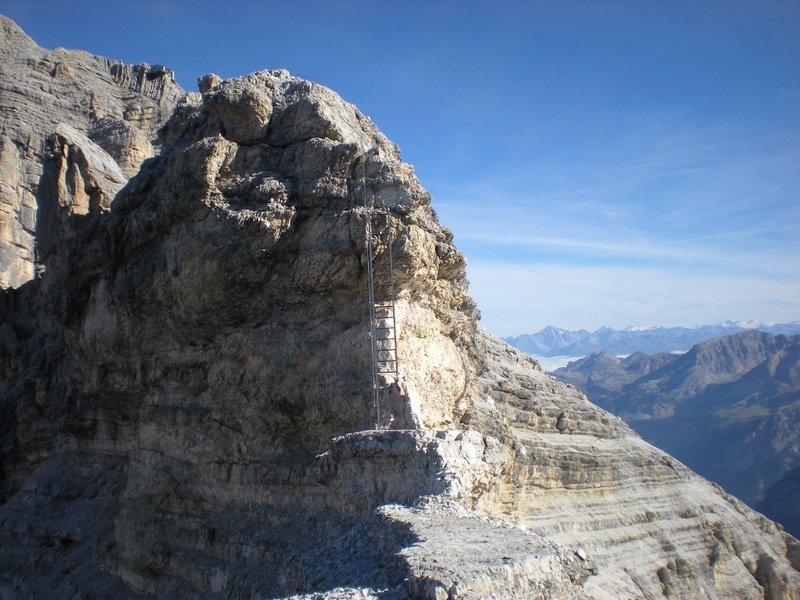 Further climbing, passing several ladders and exposed ledges, leads to the summit of Tofana di Mezzo (3244m). It is common to end the route here using the descent options described opposite, however, for those masochists who want more, descend 50m or so towards and the cable car station and follow as for Lamon/Formenton – see opposite. 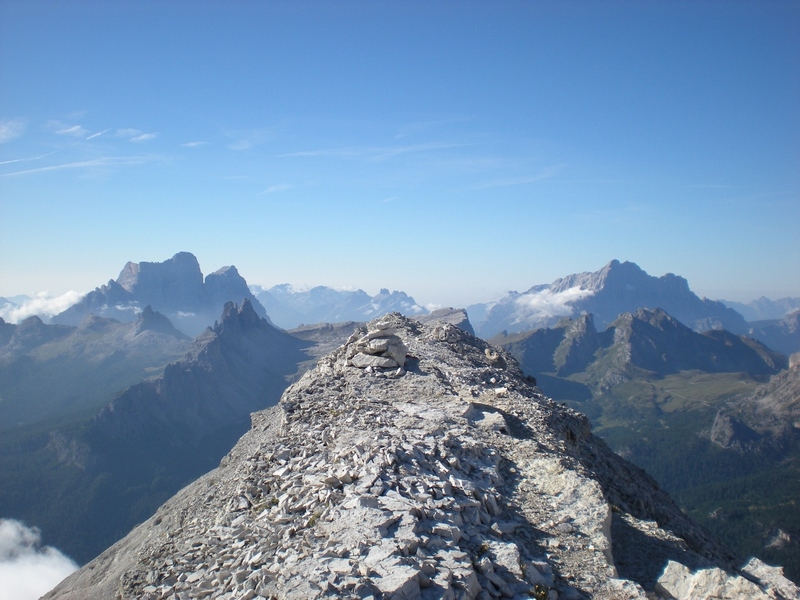 This entry was posted in ITALY, MOUNTAINEERING, THE ALPS and tagged alps, alta badia, diary, Dolomites, Giuseppe Olivieri, holiday, italy, journal, mountain, MOUNTAINEERING, photography, Pomedes Hut, Punta anna, Tofana di Dentro, Tofana di Mezzo, travel, Via Ferrata, walking. Bookmark the permalink.